Perhaps your professional and other life ambitions are simply a means to an end—a way to pay the bills or pursue a lifestyle. But what if there was something more? What if you could have success and fulfillment in equal measure? In response to these fundamental questions, Professors Jeffery A. Thompson and J. Stuart Bunderson draw on research, personal experience, and gospel truths to dispel common myths that can stand in the way of seeking your true calling, the work that brings the greatest meaning and satisfaction to your life. Is there only one true calling for you? Can you still find your calling if you choose to stay at home? What if your calling doesn't pay enough to live on? Discover the answers to these questions and many more as you learn to tap into the spiritual gifts of God and realize how your talents can bring gratification to your life and blessings to those around you. 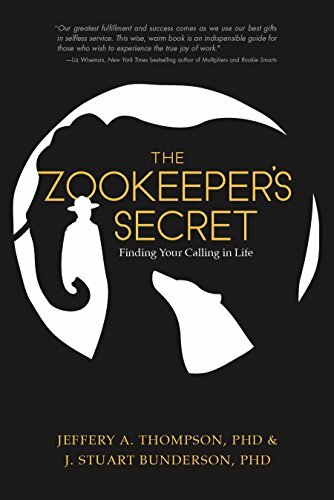 Brimming with practical activities and applications, this guidebook to pursuing your ideal life's work will inspire the confidence you need to translate aspiration into action. For some reason, when I started reading this book, I had it in my head that it was all about church callings and how to magnify them, no matter what they are. Clearly, I didn't pay full attention to the description of the book, because that's not what it's about at all. I'll be honest, this is not a book I would have ever picked up and read on my own, because it's not something I've really given much thought to. I'm a stay-at-home mom by choice, so I guess I would consider that my calling in life. That being said, I ended up marking several passages in this book that apply to me. While this book is kind of dry in some areas, it does have a lot of good information in it, and it definitely makes you step back and examine your life to see what you can change to make where you're at work better for you.